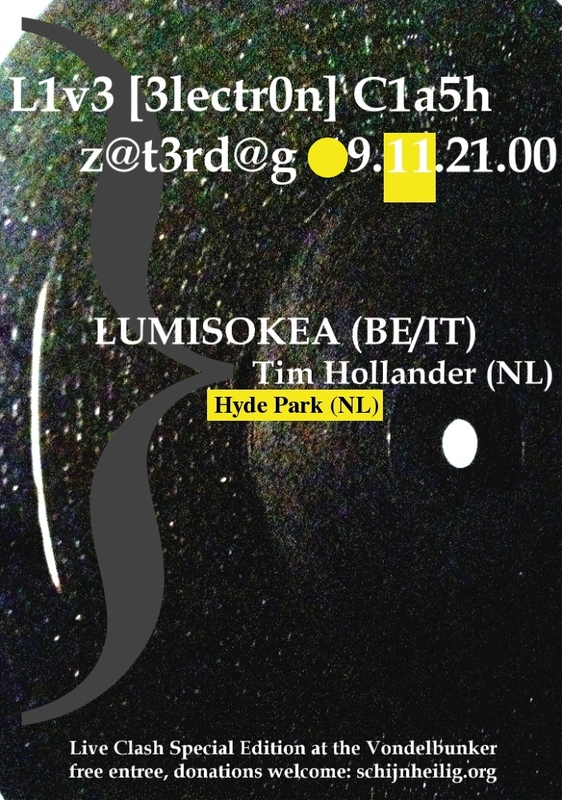 Lumisokea is a Belgian-Italian duo, formed by Koenraad Ecker and Andrea Taeggi. Their music is at once highly physical and rich in texture, using both acoustic (cello, prepared piano) as well as (analog) electronic instruments to create a dark and introspective listening experience. Lumisokea had wide critical acclaim in 2012 with their sophomore album ‘Selva’ on which they uniquely unify vastly different music styles as bass music, musique concrète, contemporary classical, dub and the more experimental side of techno. They are now on tour for their forth coming EP ‘Apophenia’, which is more focused on the machine-like and propulsive side of our music, incorporating rhythmical elements coming from south Indian classical music, techno & dub. As a visual artis, Tim Hollander finds also great interest in the nature of sound and its repetition, resulting in musique concrete-like works and minimalistisc recordings based on a few simple parameters, as there is: only using preset kicks, snaredrums and typical deephouse stabs which are played, recorded and looped live at new tempi, which makes that the tracks are build up out of different rhythms that match and collide troughout the track. From his website: “In my dictionary Hyde Park is a synonym for landscapes, in whatever form. I create this audiovisual experience through music and film. The music that I make lets you drown in a bath of warm sounds. My first LP, Hidden Nature, just got released on the label 6e Kolonne.